Jeffery Linn’s Drowned Cities Maps #ArtTuesday « Adafruit Industries – Makers, hackers, artists, designers and engineers! I use only real-world data in the creation of these maps. Both the terrain and sea levels were modeled using publicly available raster elevation data. 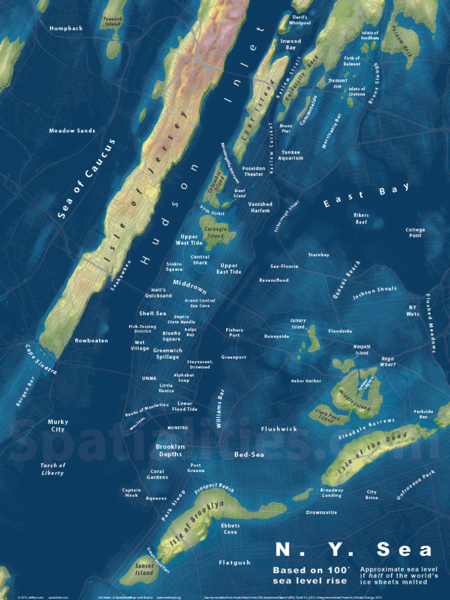 The original map renderings were done using data from the USGS–this dataset showed an estimated maximum sea level rise of about 260′ (see http://pubs.usgs.gov/fs/fs2-00/). I made the maps in a range showing between 240′ and 260′, depending on what produced the most interesting-looking result.